WAIST HIGH: Remember The 80s Book Now Available. 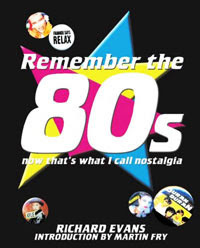 Remember The 80s Book Now Available. Waist High friend and long time material source Richard Evans of remembertheeighties.com has finally seen his book Remember The 80s - Now That's What I Call Nostalgia published by Anova's Portico imprint and it is now available at the Remember the Eighties online shop. It will also be coming to "all good bookshops" in the UK very soon. Evans says the book is a "journey through the 80s, stopping off along the way to take a closer look at some of the landmarks of the decade, not just the music (although there is a lot of that!) but also the news, films, games, TV, fads, fashions, entertainment, politics and people." Also included in the book are memories and pictures submitted by readers of the website while the book was being written in 2006, which "makes the book very much a shared journey." The book contains ten chapters, one for each year, which include, "AN OVERVIEW OF THE YEAR'S KEY EVENTS, A DETAILED LOOK AT THE YEAR IN MUSIC, THE YEAR'S UK NUMBER ONE ALBUMS & SINGLES, KEY TV AND CINEMA RELEASES, (AND) MY C90 MIXTAPE TRACKLISTING OF THE YEAR'S ESSENTIAL SINGLES." A peek inside Chapter 4: "In which I argue that 1983 is the year in which some of the most defining songs of the 80s are released; celebrate the genius, oddness and general impact of Michael Jackson; re-examine the legacy of Margaret Thatcher; chart the start of goth; talk to Spandau Ballet about recording and releasing their classic album True; fail to be entirely convinced that the new-fangled CD format will ever take off; identify an emerging 'Old Wave' movement of classic older artists; ask the question whether the Sinclair ZX Spectrum is better than the Commodore 64; become a little bit too interested in The Smiths, and wonder exactly who was buying all those Ryan Paris records."